Behold the glorious future of neural networks: disembodied faces rotating in the darkness. Research submitted to Cornell University uses deep neural networks to create detailed 3D models of faces using a single 2D picture. The results are remarkably accurate. Researchers Hao Li, Shunsuke Saito, Lingyu Wei, Koki Nagano, and Liwen Hu wanted to create super detailed face models without the need for professional lighting or even a full photo. Face mapping at this level usually requires a series of photos in ideal lighting to make sure you get all the curves, angles, and asymmetries of the face. 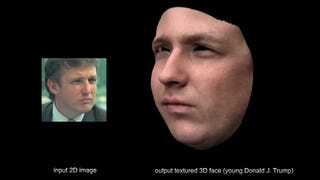 The researchers relied on an extensive “face database” (a real thing that exists) to make smart inferences on the finer details of each face. 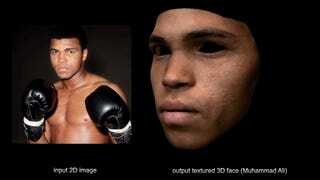 Neural networks create the face by filtering through a network of possible textures before scanning and then blending the pertinent facial features and skin tones. As with everything, there are privacy concerns for people who want to be assholes. There are photos of everyone online, so what’s to stop someone from wearing a different face while trolling online? Imagine playing a 3D game and seeing yourself as the face of the avatar going Leroy Jenkins and ruining things for the team or, worse case scenario, harassing other players. For now, though, let’s hope that the technology will be used as it’s intended, easy, high degree realism in virtual space. Maybe we can one day print it out URME style. Pioneered by “Leo Selvaggio” (a Bond-sounding pseudonym) URME are 3D printed masks that disguise you to face recognition software. So in sense, we could finally fulfill our dystopian dreams of a virtual world in which everyone is a photorealistic, 80's era Trump.